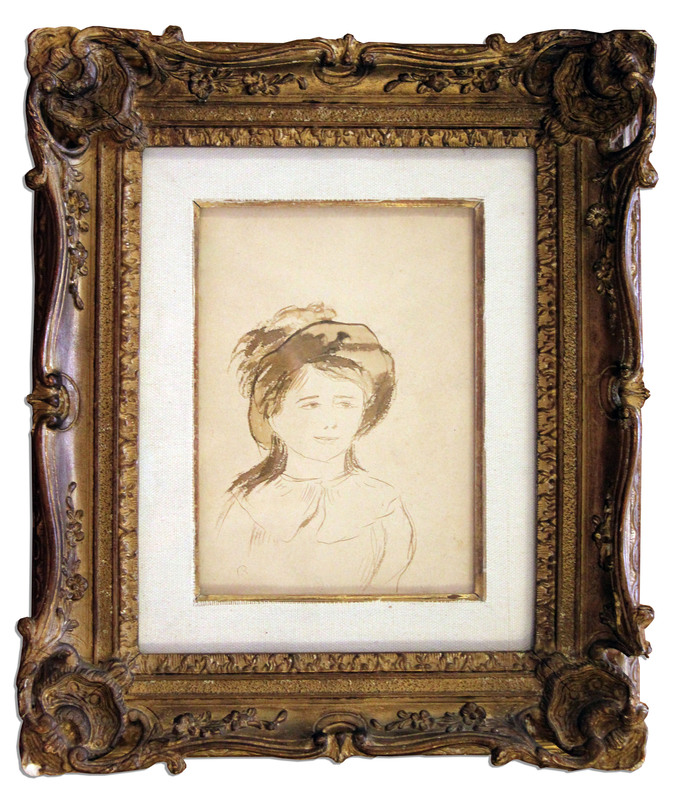 French Impressionist master Pierre-Auguste Renoir pen and ink drawing with ink wash of a young girl with a hat, entitled ''Fillette''. The drawing, created circa 1882, is signed with the initial, ''R''. Renoir, who had been painting Parisian scenes for many years, saw his fame take off when, along with other Impressionist painters, including Monet, Degas and Cezanne, his work was represented in the first Impressionist Exhibition in 1874. He painted scenes of people at work and play, often painting women and girls. He was known for his free brush strokes and the warm sensuality present in the light and color of his palette. Two of Renoir's most famous paintings, ''Luncheon of the Boating Party'' and ''Girl With a Hoop'', were completed during the early 1880's when this drawing was made. The drawing, measuring 5.5'' x 7.75'', is in fine condition. With provenance from Sotheby's. Also featured in: (1) page 171, Vol. II of ''Pastels & Drawings of Pierre-Auguste Renoir'' by Ambroise Vollard. Paris: 1918; (2) page 568, Vol. II of ''Renoir. Catalogue Raisonne of the Paintings, Pastels, Drawings and Watercolours 1882-1894'' by Guy-Patrice & Michel Dauberville. Paris: 2009. Described here as watercolour and without mention of signature.